To facilitate the flow of information among market participants, especially in terms of better issuer disclosure. Unemployed members may apply to have dues waived until employment is found. A job bank is made available for all members, free of charge. Discounted registration fees for unemployed members. Government employees may apply for discounted registration to NFMA educational events. Students may apply for discounted registration to NFMA educational events. The NFMA holds an Introduction to Municipal Bond Credit Analysis each Fall. This event, which has been held annually since 1987, is open to new analysts, seasoned analysts seeking to broaden their knowledge bases, bond sales, trading and support staff, government employees and students. Members of constituent societies are automatically members of the NFMA. In addition, individuals not located in proximity to a constituent society may join the NFMA as Affiliated Individuals or Associate Member. Membership in the NFMA totals over 1,300, representing the major participants in the municipal market, including institutional investors, bond rating agencies, bond insurance companies, portfolio managers, investment banking firms and financial advisors. Beginning in 2013, the NFMA began a Student Membership category. The NFMA has been a strong advocate of improved disclosure in the municipal market since its inception. 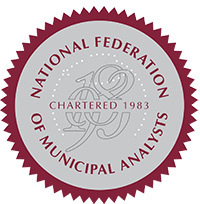 Throughout its history, the NFMA has issued comment letters and position statements on relevant topics in the municipal market. In 1990, the NFMA published the Disclosure Handbook for Municipal Securities, updated in 1992, with a desire to communicate to the municipal bond industry the information needed by analysts to make informed investment decisions. In 1994, the NFMA published secondary market disclosure forms covering 15 separate sectors in the municipal bond market. Commencing in 2000, the NFMA began a series of Recommended Best Practices Papers and White Papers dealing with the various sectors in the municipal bond market. These papers are typically products of months of drafting and review by committees composed of experts from our membership and other market participants. In addition, the NFMA publishes electronic newsletters for its members three times per year. An Annual Conference is held each spring in various locations. Attendance ranges from 300 to 400. The Introduction to Municipal Bond Credit Analysis has been held each fall since 1987 and Advanced Seminars are held each fall and January throughout the country. To see the Event Calendar, click here. The NFMA has presented awards annually since 1984. Each year the Awards Committee convenes to determine which individuals or entities further the goals of the NFMA for the advancement of the municipal bond industry. To view the recipients of NFMA industry and service awards, click here. To view the recipients of NFMA Disclosure Awards, click here.